AKS offers a managed Kubernetes Platform on Microsoft Azure. This course will teach you the basics of Kubernetes, deploy an AKS Cluster and run, scale and update application code in AKS with minimal effort. Unless you have been living under a rock, you may have come across the term "Containers". They are hot, they are here, and most businesses need a solution to manage them, as they can quickly spiral out of control. Kubernetes has emerged as the leader in the container orchestration and management platforms. However, this begs a question: Who will manage your Kubernetes Infrastructure? 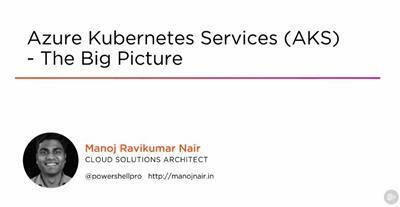 In this course, Azure Kubernetes Service (AKS) - The Big Picture, you will learn the skills to deploy a managed Kubernetes platform on Microsoft Azure without worrying about the underlying computer and management overhead. First, you will learn the fundamentals of Docker and Kubernetes and see how it applies to a Microservices Architecture. Next, you will discover how to deploy an application to a local Kubernetes Cluster and see how that experience translates to deploying the same application to Azure Kubernetes Service without any change to the deployment experience. Finally, you will see how easy it is to scale your application workloads in AKS, which will help you take your AKS skills to the next level and help you modernize and re-platform your application workloads on Microsoft Azure. By the end of this course, you will have a foundational knowledge of Azure Kubernetes Service that will help you deploy containerized workloads on Azure with minimal management overhead.